Allimed is a high quality garlic product containing stabilized allicin, Allisure. Allimed capsules acts to support the immune system along with a healthy diet. Allimed has been said to alleviate symptoms of Irritable Bowel Syndrome (IBS), Small Intestine Bacterial Overgrowth (SIBO), MRSA and Lyme disease which negatively impacts the lives of so many people. 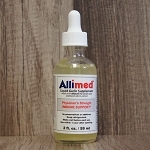 Allimed is a high quality garlic supplement containing stabilized allicin, Allisure. Allimed liquid acts to support the immune system along with a healthy diet. Allimed has been said to alleviate symptoms of Irritable Bowel Syndrome (IBS), Small Intestine Bacterial Overgrowth (SIBO), MRSA and Lyme disease which negatively impacts the lives of so many people.